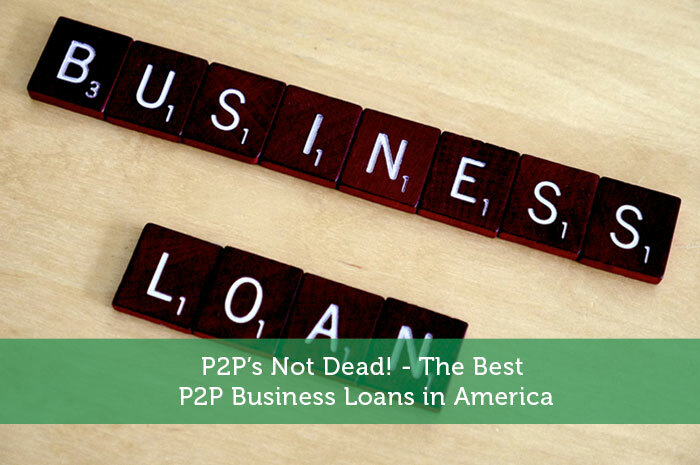 So what’s the best way to get a P2P Business Loan? Step 1: Live in Europe. Alas, most of you do not. The reason I say this is because P2P is robust in the UK. Lots of competition, healthy regulation, and a real commitment to the “peer” ethos of P2P have made this a truly inspiring financing model in England. The US has about as long a history as the UK, but US P2P innovation has been largely squelched as it some key players have been swallowed up by the same-old-same-old finance institutions this model was meant to exclude. That being said, even though this reality has given birth to glum headlines advertising the industry’s demise, real American P2P does still exist. Prosper and Lending Club are the two most prominent examples. Lending Club has the better reputation of the two, and tends to offer the most reasonable loan terms. These average roughly 12% at present, though rates as low as 6.81% APR are available to the most qualified candidates. I also like Lending Club because they still use the traditional Peer-to-peer model, wherein real human beings (not corporate monoliths of finance) lend money to other real human beings. P2P companies come and go, which is why I recommend Lending Club, a reliable player with almost a decade of lending experience. I am interested to hear other sources you have experience, so please comment below. With a lender like Lending Club, qualifying businesses will have their credit and merchant histories quickly analyzed to determine their creditworthiness. Loans are available up to $300,000, and are supplied by individuals who use a reverse auction system to bid for the loan, the loan going to the investor willing to issue it at the lowest level of interest. The beauty of the model is that competition efficiently drives down these rates and speeds up the approval process, often for businesses that can’t easily acquire a loan through traditional channels. I’ll include here some loan providers who are not P2P, but have emerged as similar alternatives that work for the same types of businesses. I’m talking about companies like FundBox, which issue loans by request, against an existing line of credit. These credit lines will be in the tens or hundreds-of-thousands of dollars, each loan meant to cover the gap between invoice and payment. Many businesses wait 30 to 60 days, or more, to receive payment for such invoices, and B2B lenders like this are there to help their users maintain cash flow, very much like their P2P cousins. So we have two forms of business loans, P2P and B2B, both offering quick cash infusions to American businesses with agreeable terms. My advice when seeking out a P2P or B2B lender is pay attention to the terms. Companies like Kabbage have earned the ire of hundreds of American businesses by issuing loans with surprise fees and inscrutable policies. The best providers make the process incredibly easy to understand. They’re never cheap (though the best businesses won’t charge you for early repayment), but that isn’t the point. This is about access and convenience. If your business has trouble getting a traditional loan, or needs one more quickly than your traditional lending institution can offer, P2P/B2B may be for you. So take a look at the companies I’ve recommended and let me know about some of your favorites. With time, I hope American P2P lives up to some of its early promise. As a reasonable alternative to traditional financing, the form will only take hold if we use it. So take advantage of the competitive terms and excellent service you can expect from the best P2P and B2B loan providers. Thanks for the interesting analysis, Andrew. I just wonder why there are only 2 large players in the P2P / alternative business loan market. Obviously there’s a lot of business potential in this niche, so how come we only know Prosper and Lending Club?